1) Take care of the chemistry. It is recommended by Wikihow.com, to make sure the pH, the alkalinity and calcium are in balance. This step should take place about five days before the pool is shut down. Take a test kit, check the chemical levels, and adjust as needed. Using a recommended shock product, shock the pool water to kill bacteria. Remember, if using a strong shock product, don’t let swimmers in the water right away. A final chemical step is to add a winterizing algaecide. The pool owner doesn’t want to take the cover off in the spring to find discolored water and a bad odor, so this step is important. 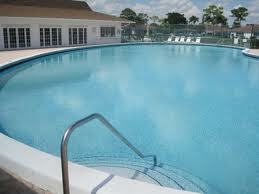 2) Give the pool a good cleaning. First remove ladders, baskets, hoses, filters and all decorative fittings. Rinse all that equipment and lay it out to dry, then store it for next spring. Use a skimmer to clear out debris in the pool, then vacuum and brush the bottom and sides of the pool. 3) Lower the water level and drain the equipment. The water should be lowered below the level of the skimmer. Then drain the water from pumps, filters, heaters and chlorinators, so it can’t freeze inside the equipment and cause damage. Take each piece of equipment and open the drains to release water inside it. Remove filters, clean them thoroughly, and store them (where they can be found in the spring). Use a shop vacuum to blow remaining air out of filters. 4) Take care of the plumbing. Just like wrapping exposed water lines outside the house, lines running into the pool need to be prepared for winter. This procedure involves taking a shop vacuum and blowing air through the equipment, from the skimmer, and back into the pool. Then plug the lines at the pool so more water can’t get inside. Some people recommend adding swimming pool antifreeze to prevent remaining water from freezing, while other sources are not so convinced. This appears to be a personal preference item. 5) Cover the pool. Make sure the cover fits snugly and doesn’t have any gaps where debris could enter the pool and collect over the winter. A mesh cover is recommended for the best protection, while solid floating covers don’t appear to fit as well. For winterizing an above ground pool, air pillows are suggested, since thy prevent the expansion of ice in those types of pools. Knowing that the family pool is well protected over the winter is a great source of comfort. Now the pool owner can sit inside during cold weather and not worry about the pool developing a problem. Equally important, when heading out to open up the pool next spring, there are no surprises, like a broken pump line, or a nasty algae outbreak. David East has lived near the beach since he was a kid. He’s a little slower getting up on the surfboard these days, but enjoys it just as much as ever. Working freelance for intheswim.com, David always enjoys the challenge of a new writing assignment.